Beautiful Love is a popular song (1931) composed by Wayne King, Victor Young and Egbert Van Alstyne with lyrics by Haven Gillespie. It has become a jazz standard. While originally recorded as a waltz it is typically played in 4/4. 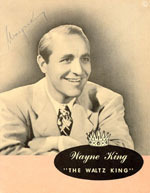 The song was introduced by the Wayne King Orchestra. I am unsure if there is an available recording – please let me know if you know of one. Beautiful love, you are a mystery. Beautiful love, I’ve roamed your paradise. Reaching for heaven, depending on you. Beautiful love, will my dreams come true?